The classic hamburger has gone from relatively humble beginnings to become an enduring symbol of fast food culture. I remember when my Mum first visited the USA, Dad had been going on business since the late 60s, but it was the mid-70s before my Mum went and she came back having eaten homemade burgers, made only with beef and we never ate a manufactured burger again! 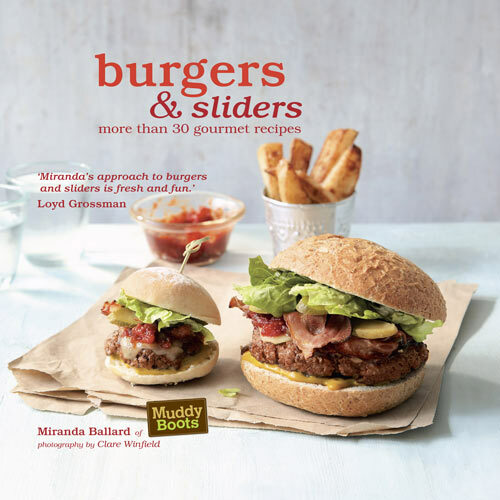 Burgers and sliders by Miranda Ballard is a slim volume packed with 30 gourmet recipes for full-on fat burgers and their mini cousins, the slider! The Muddy Boots Story tells how Miranda and her husband set up their company making quality burgers using top cuts of the finest ethically farmed beef. 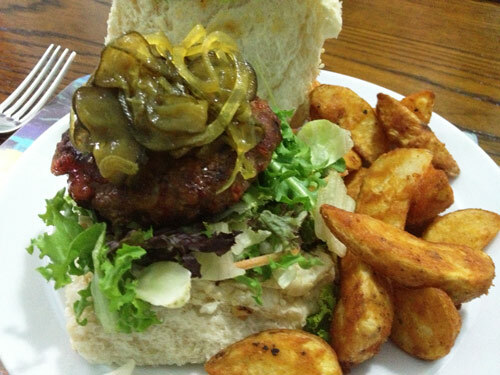 Making, Shaping and Cooking gives helpful hints on how to create and cook successful burgers. Classic Beef includes The Ultimate restaurant burger, Italian burger with olives, sun dried tomatoes and pesto, Chilli Con Carne burger wrapped in grilled courgette slices, Beef, roasted red pepper & lime burger with creme fraiche and lambs lettuce (see recipe below), Beef and Black Bean Sliders and Spicy Beef and Pork Sliders with ginger and lime. More Meat includes Big Breakfast Burger with a portobello mushroom and a fried egg, Pork and Antipasti Burger with lemon mayo, Pork and Apple sliders with caramelised apple slices, Indian-style Lamb Sliders with Minted Yogurt & Mango Chutney. Other Ideas includes Fish Pie Burger with Capers and Tartare Sauce, Cheesy Root Vegetable Burger with Mustard Mayo, Chicken Caesar Sliders, Christmas Canape sliders with cranberry sauce and Camembert. Sauces and Sides including Homemade Fries, Mustard Mayo, Herb Mayo, Pesto Mayo, Homemade Tomato Ketchup and Classic and Sour Cream Coleslaw's. These are a selection of the recipes in the book but by no means all of them. Pre-heat the grill/broiler to high. Drizzle the pepper pieces with the oil and sprinkle with salt and pepper. Put them on a baking sheet and cook under the grill/broiler for 8-10 minutes, shaking regularly to brown evenly. Remove form the grill/briler and set aside to cool. 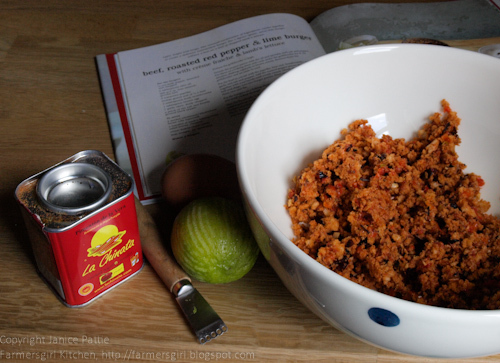 Put the beef in a bowl with the paprika, lime zest, breadcrumbs, egg, garlic and salt and pepper. Add the roasted pepper pieces and work together with your hands until evenly mixed. 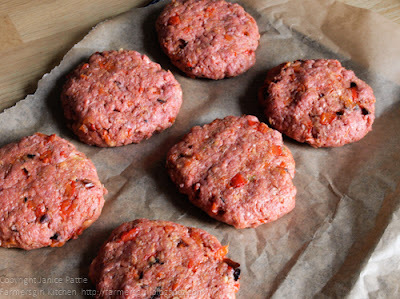 Divide the beef mixture in half and shape into tow burger patties. Press each burger down to make them nice and flat. Put the burgers on a baking sheet and grill/broil for 5 minutes on each side until cooked through. Slice the bread rolls in half, if using., and put a few lamb's lettuce/corn salad leaves on the bottom half of each bread roll. 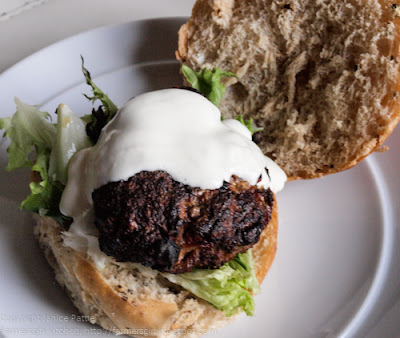 Add the cooked burgers and top with a large spoonful of creme fraiche/sourcream. Finish the burgers with the lids of the bread rolls, if using and serve with lime wedges, for squeezing. The burgers had a really nice texture, they cooked through well, both under the grill, and also when fried. They have a good flavour with the smokiness of the roasted peppers and paprika (I used smoked paprika) giving a barbequed flavour without a barbeque! Anyone who likes burgers and wants to try making their own, or who wants some inspiration as to how to make their burgers more exciting. This is a go-to book for barbeques and family meals. I think a lot of the mixtures would also make great meatballs. Specialises in one type of dish, so you know what you are getting, nice big pictures (you know how much I like a good picture!) and the recipes are well laid out. Not a lot of veggie options. Yes, if you make a lot of burgers. Good to give as a gift to an adventurous BBQ King or Queen. I have one copy of Burgers and Sliders by Miranda Ballard to giveaway to one lucky winner. Just follow the instructions on the Rafflecopter widget below. The giveaway ends on 31st August 2013. Here is a second serving of the same burgers (I made extra burgers and froze half, then thawed overnight and fried up quickly for a mid-week supper). This time I served them with some potato wedges and added some of the fabulous Sweet Cucumber Pickle I made at the weekend. The recipe is an exclusive on Farmersgirl Kitchen Facebook page. Like the page to access the recipe. Great review and blog post Janice. Those burgers look amazing! It's incredible how trendy burgers have become. Potato wedges and onion rings. I'd go for sweet potato wedges too! Sounds delicious! I made a huge hamburger for my first ever post on my blog a year ago on the page called My first blog under the title Lets get cooking. :-) http://www.corriecooks.com/90362074 I probably make them at least once a week for my son. He makes his own 'special' sauce which is a combination of mayo, smokey bbq sauce, chilli sauce and mustard. Yours look fantastic especially with the hot chips on the side. Burgers are fantastic - definitely under rated in certain quarters. I'd serve mine with a home made pesto, to give it an extra dimension. Thank you so so much for reviewing my book (my first book so I get a little nervous!). I'm really thrilled you liked it and the photo of the one you made looks better than I can do. a crisp green salad and some gherkins! Simona - hope you make them, let me know what you think. Jane - mmm chipotle mayo, spicy and smoky. Kate and mellysocks - salad is a must! mpsandy - yes potato wedges finish the meal. Liz - Sweet Potato wedges what a great idea. Corrie - that sauce sounds great, your son must be a great cook! Miranda - thanks for commenting, it's a lovely book, great recipes. Potato Wedges and since it's summer - corn on the cob! Sweet potato wedges and bacon aioli!